If you're anything like me, you know E.B. White's Charlotte's Web pretty well. I read the book many times when I was younger, and even read it out loud during a family vacation a few years ago. But I wasn't aware of much of the book's backstory, so when I saw Michael Sims' The Story of Charlotte's Web: E.B. White's Eccentric Life in Nature and the Birth of an American Classic (Walker & Company, forthcoming) I knew it was a must-read. Sims has done a fantastic job here, writing a short biography of White's life and career but really digging into the author's process of creating Charlotte's Web. Drawing on White's papers (at Cornell) and looking carefully at his drafts, research notes, designs and inspirations for the book, Sims has managed to write as much a biography of the book as of the man who wrote it. White's childhood, college days, career, and his life as a Maine farmer with a deep and meaningful relationship with the world around him all come into play here, but it's that final aspect (his love of animals and his understanding of how they fit into the world) that really played into the creation of his story. Sims' partial reconstruction of White's research process by examining the notes he took on various spider reference sources while trying to pin down Charlotte's identity and life story was riveting, and White's own sparkly writing is used to great effect. If you've ever enjoyed White's masterpiece, or like to know the "story behind the book," this is a title you should be sure to add to your shelves. It's a keeper. - An update on what's happening with the Digital Public Library of America. - The Bayerische Staatsbibliothek in Munich is digitizing its extensive collection of bookplates: check out the first bunch here. - Catalogers made a really neat find in Sir Walter Scott's library recently: "The Grotesquiad," a 9,000-word poem by James Beattie. - From the NYTimes, a look at trends and takeaways from BEA. - Some interesting (and possibly very big) metadata news from the Library of Congress. - Lambuth University (soon to close) sold off its book collection and other items at auction this weekend. - A profile of the Voynich Manuscript ran last week in the Telegraph. - Huge congratulations to the team at Transcribe Bentham: they received an Award of Distinction in the Digital Communities category of the Prix Ars Electronica. - Joshua Kendall's The Forgotten Founding Father; review by Jesse Sheidlower in the NYTimes. - David McCullough's The Greater Journey; reviews by Stacy Schiff in the NYTimes; Janet Maslin in the NYTimes; Wendy Smith in the LATimes. Back from BEA, which was great fun; it was nice to catch up with publishers I've emailed with for a long time, see what they've got coming up and what they're excited about! The travel-madness continues: we're off to Cleveland this afternoon for a wedding, back to Boston Monday afternoon. Wednesday afternoon I'll head up to Portland to meet the movers with all our stuff on Thursday morning ... and then Friday morning it's off to Charlottesville for the first round of Rare Book School! With all that, posts may be few and far between, but I'll get things up as I can. I can't bring to mind another book quite like Rebecca Hunt's Mr. Chartwell (Dial Press, 2011). Young librarian Esther Hammerhans and the retired Winston Churchill are united here by a mysterious and not-entirely-welcome stranger, the black dog Mr. Chartwell. Imaginative, different, and filled with an interesting cast of characters and some improbably humorous moments, Mr. Chartwell is a neat read about an unexpected topic. Christopher Wakling's The Devil's Mask (Faber and Faber, 2011) is a historical mystery (think something along the lines of David Liss' books, though this one is not at the same level), set in Bristol during the first years of the nineteenth century. The slave trade has been abolished, but young lawyer Inigo Bright discovers that the practice may not be quite eradicated. When he gets too close to some uncomfortable truths, he finds his very life may be in danger. While an entertaining, fast read, The Devil's Mask lacked contextual details, and some of the side-plots went undeveloped (Bright's relationship with his bride-to-be and her family could have used some fleshing out, for example). Short interludes from a different perspective pretty much give away the game right from the outset, so by the end there's little mystery left. Overall, good for a weekend afternoon's entertainment, but there are certainly better books in the genre. - Parts of Jane Austen's unfinished manuscript of her novel The Watsons will be sold at Sotheby's London on 14 July, with estimates of £200,000-300,000. - Last September I noted that book thief Sean Cowie had skipped bail and was on the lam; this week the Stirling Observer reported that Cowie (now back in police custody) has told police he has cancer, but his former girlfriend says he's simply lying. - The University of Pennsylvania libraries have received a $300,000 NEH grant to digitize approximately 1,000 European and American manuscripts from 1601-1800. The digitized manuscripts will be added to the Penn in Hand: Selected Manuscripts site. - Google Books announced this week that it's making available a selection of 16th and 17th-century books in full color: and they're quite nice, actually. - Art book collector Arthur Jaffe is profiled in the Orlando Sun-Sentinel. - The LATimes has a "summer reading guide" out today, with recommendations from a wide variety of genres. - Since 2007 this blog has followed the murder case of Missouri book collector Rolland Comstock. This week reports emerged that the case was before a Greene County grand jury, but that no indictments were handed down. The Columbia News-Leader ran a retrospective and update on the Comstock story as well. - John Hendel covers the 125th anniversary of Linotype, writing for The Atlantic (it includes the trailer for Doug Wilson's "Linotype: The Film," which looks tremendously interesting. - At Salon, Paul Shaw looks at "Fonts that could have been great." - Amazon announced that Kindle book sales have surpassed sales of print books for the first time. Michael Lieberman at Book Patrol has the best take on this I've seen yet. - A new list of recent and forthcoming books on early American topics is up on the Society of Early Americanists site. - From the Fine Books Blog, Rebecca Rego Barry looks at some recent auction consignments by historical societies. - Jacqueline Yallop's Magpies, Squirrels and Thieves: How the Victorians Collected the World; review by Mary Crockett in the Scotsman. - Michael Parker's The Watery Part of the World; review by Emily Barton in the New York Times. - Frank McLynn's Captain Cook, Master of the Seas; review by Roger Hutchinson in the Scotsman. - Revolutionary Founders (ed. Alfred F. Young, Gary Nash and Ray Raphael); review by Mary Beth Norton in the New York Times. - Daniel Richter's Before the Revolution; review by J.H. Elliot in the NYRB. Okay, where to begin? The 18 May Sotheby's Paris sale of Books and Manuscripts brought in a total of €2,022,300; full results are here. The Robespierre and Philippe le Bas papers were pre-empted by the Archives Nationales de France, for a combined bid of €979,500; a news release reports "tumultuous applause" when the documents were saved for the nation. Marcel Pagnol and Jean Cocteau manuscripts were also pre-empted, by the BNF and Paris History Library respectively. Andy Warhol's 1¢ Life (1964) fetched €108,750, while the typescript copy of Le Petit Prince(1943) brought in €70,350. The Printed & Manuscript Americana sale at Christie's New York on 19 May brought in $1,103,125, with 159 of 210 lots selling. The top lot ended up being a collection of Jackie Kennedy Onassis letters, which sold for $134,500. The Peter Force Declaration of Independence made $17,500. The Breeden-Raedt aende Vereenichde Nederlandsche Provintien and Franklin's copy of Dryden and Lee's Oedipus (1735) did not sell. The Sanford B. Dole family archive archive of letters and clippings made $9,000 at PBA Galleries on 19 May. And now on to yesterday's event: the third round of Copley sales at Sotheby's New York. The third selection of American Historical Documents brought in a total of $2,472,258; full results are here. Many of the top-estimated lots didn't meet their reserves: the Dwight Eisenhower letters to his wife Mamie, as well as the archives of material relating to John Charles Frémont, the 1865 Hampton Roads peace conference, the assassination of President Garfield and the trial of Charles Guiteau all failed to sell, as did the first edition of The Federalist (New York: 1788) in contemporary boards. Washington's letter to Nathaniel Gorham celebrating the ratification of the Constitution did better than expected, selling for $182,500, and the Lincoln letter to the House of Representatives from May 1864 made $68,500. Three copybooks kept by Tobias Lear during his time as U.S. Consul at Algiers fetched $80,500. Last but certainly not least came the two John Lansing notebooks from the Constitutional Convention, which ended up selling for $902,500 once premiums are factored in. I was watching the sale online, and the buyer appeared to be in the room, but no word has yet come through on the identity of the notebooks' new owner. Another week without new books; aren't you proud of me? Next week, however, I'll be at Book Expo America, so the trend cannot possibly hold. I will, however, be able to ship things directly to the new house, so as to save packing and schlepping! William S. Peterson and Sylvia S. Peterson, co-authors of the just-released The Kelmscott Chaucer: A Census (Oak Knoll Press, 2011) have started a blog, The Kelmscott Chaucer, to track updates and additions to their census. I've added a link to the sidebar. As I've said before, I am a huge fan of book censuses, and absolutely support this effort. I urge anyone with information on the Kelmscott Chaucer to pass it along, and keep an eye on this blog for what I'm sure will be fascinating updates. I'm looking forward to browsing the book as well, when I can. - The Sotheby's London Travel, Atlases, Maps & Natural History sale on 10 May brought in £1,393,000. Full results here. The Egyptology items did particularly well: the unexpected top lot was a first edition of Ippolito Rosselini's I Monumenti dell'Egritto e della Nubia (1832-1844), which made £169,250. Champollion's Monuments de l'Egypte et de la Nubie (1835-1845) fetched £85,250. A copy of Description de l'Egypte did much better than expected, fetching £99,500 over estimates of £20,000-30,000. The Egyptian archive of embroidery templates and artwork sold for £73,250. Gould's Birds of Europe was the only non-Egypt-related high seller; it made £56,450. The 1570 Paolo Forlani world map and the first edition of Purchas his Pilgrimes did not sell. - Watch the summer Fine Books & Collections for my full take on the 11 May Michel Wittock sale at Christie's Paris on 11 May, but full results are here. Of the 80 lots, 57 sold, for a total of €1,738,037. That spectacular copy of Description de l'Egypte was by far the top lot, reaching €1,095,400. Several of the fine bindings also sold well. - The Importants Livres Anciens, Livres d'Artistes, et Manuscrits sale, also at Christie's on 11 May, saw 192 of 238 lots sell, realizing €3,282,250. Four of the top five lots, all hammered down at more than €100,000, where John Gould works: his Birds of Australia (€199,000); A Monograph of the Trochilidae (€151,000); The Birds of New Guinea (€111,400); and Birds of Asia (€109,000). The other top lot was a Mozart music manuscript, which fetched €115,000. - Swann's Literature; Art, Press & Illustrated Books sale on 12 May saw a copy of the Jasper Johns/Samuel Beckett Foirades/Fizzles as the top lot, making $16,800. - At Bloomsbury London's Continental & English Literature and Manuscripts, the top lot was two A.E. Housman manuscript poems, which made £10,000. For what's coming up in the second half of May, see my preview post. - The May Fine Books Notes is out, with a feature by Nick Mamatas on Lovecraft's Providence, Nick Basbanes on collecting ephemera, Ian McKay on recent auction highlights, and more. - A special issue of Common-place is up as well, "American Food in the Age of Experiment," edited by David Shields. Great content, as always! - Ian has a sum-up of last weekend's MARIAB fair in Wilmington, MA. - Booktryst has the great story of bookseller Vic Zoschak's eBay find of five hand-written ledgers containing the records of the Senate Appropriations Committee from 1879 to 1909. The ledgers will be going home to the Library of the Senate. - New Tumblr: Biblio-Tech, on, well, biblio- and tech- stuff! - Some spaces are still available in this summer's London Rare Book School courses. - The Passage author Justin Cronin talks to the Cleveland Plain-Dealer about his literary roots. - Yale announced this week that millions of digital images of objects in its museum, archive and library collections will be made available to the public through a new open-access policy. More than 250,000 images are already online in the new Yale Digital Commons catalog. - One of those great book-find stories this week: a South African tourist picked up a €3 book at a Limerick flea market and sold it for more than €8,000. It was a first edition of Wuthering Heights. - Harvard professor Leah Price is profiled in the Harvard Gazette about her work on books as physical objects: she's got a book coming out later this year, Reader's Block: The Use of Books in Nineteenth-Century Britain. - Suzanne Marrs, ed. What There is to Say We Have Said: Correspondence of Eudora Welty and William Maxwell; review by Richard Eder in the Boston Globe. - Geraldine Brooks' Caleb's Crossing; reviews by Matthew Gilbert in the Boston Globe and Jane Smiley in the NYTimes. - N. John Hall's Correspondence: An Adventure in Letters; review by Rebecca Rego Barry in Fine Books Notes. - Molly Peacock's The Paper Garden; review by Andrea Wulf in the NYTimes. - Erik Larson's In the Garden of Beasts; review by Philip Kerr in the Washington Post. 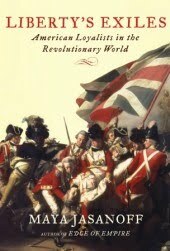 I'll just say right at the outset that Maya Jasanoff's Liberty's Exiles: American Loyalists in the Revolutionary World (Knopf, 2011) is going to be in my list of 2011's best books. As I read it, I couldn't help but make the comparison to Pauline Maier's Ratification: like Maier, Jasanoff has accomplished something remarkable, writing a concise and readable narrative account of a complex process that had been written about in small pieces before but never pulled together in a comprehensive way. Jasanoff's subject is the loyalist diaspora, the emigration of some 60,000 free people (and another 15,000 slaves "exported" by their masters) from the rebellious American colonies during and after the American Revolution. By focusing on the entire spectrum of loyalist destinations, and by using specific individuals and families as case studies to frame the narrative, Jasanoff is able to tell the loyalists' stories in a way that no prior work has done, and no future work is likely to do nearly as well. One of the most salient points from Liberty's Exiles is the heterogeneity of the loyalists' views: as Jasanoff writes, "They agreed on one thing: they upheld the authority of the king--at least as long as the king did his part by them in turn. ... [M]onarchism would be about the only principle binding together a disparate population of American refugees" (p. 199). Or, put another way, "A commitment to 'British rights' could be held with equal sincerity by people with otherwise divergent views of what those rights actually were" (p. 199). When certain loyalists came to feel that their rights as British citizens were being violated, they responded, often in ways that bear a striking resemblance to their patriot counterparts in the years leading up to the Revolution. Peopling her tale with a cast of characters from across the loyalist spectrum, Jasanoff is able to put a human face on the diaspora. There are some familiar names, like Anglican minister Jacob Bailey of Maine, a Harvard classmate of John Adams' whose parishioners forced him from the pulpit and into exile in Nova Scotia, and Elizabeth Lichstenstein Johnston, whose peregrinations back and forth across the Atlantic in search of a happy and safe harbor for herself and her family make for heartbreaking reading. Then there's the large Robinson family of New York, members of which end up at all corners of the empire, as well as free black George Liele and escaped slave David George, whose travels lead them in very different directions. Jasanoff examines loyalist migrations not just to Britain and Canada, but also to East Florida (from which residents were forced to leave again after the Treaty of Paris), the Bahamas (where, I was fascinated to learn, Lord Dunmore served as governor), Jamaica, and Sierra Leone. By including in her story the whole range of loyalists: white, black (free and slave), even Indian, the account becomes much richer and more interesting than most previous treatments. In her conclusions, Jasanoff takes a wide-angle view of the diaspora, noting that while a shared folklore or language of lamentation about the departure from America never caught on among the loyalists (as there was with the exile of the Acadians, for example), and that by 1815 or so most had been absorbed into the empire in some way (or had returned to what was the United States), many had experienced severe hardship, oppressive authority, and recurring displacements. Just as there was no uniform brand of loyalism, there was no uniform experience among loyalist emigrants; some landed on their feet, while others struggled for years. Liberty's Exiles is enhanced by Jasanoff's deep research, drawing on a wide variety of archival sources (including detailed records of slaves exported from the colonies and the later records of the Sierra Leone settlements, the claims filed by loyalists in London for compensation, and tax-exemption documents required for loyalists in Jamaica). An appendix gives new and useful quantitative information on the numbers of loyalist departures, while the notes and bibliography take up more than sixty pages; I've already found some great sources there for use with a few of my own projects. While I think that in very few cases Jasanoff takes the loyalists' protestations of ill-treatment in the years leading up to the Revolution without the necessary grain of salt, overall this is as good a book on the loyalists and their lives as we're ever likely to see. - From BibliOdyssey, some 18th and 19th-century writing blanks. - Over at Notes for Bibliophiles, a neat look at "analog ASCII art"
- I quite like how Whitney Trettien incorporates Twitter and illustrations into her blog posts: here's a good example from this week, about aspects of book/print culture which may resist digitization. - Something I didn't know (thanks to @mercpol for the tip): the first 55 volumes of Studies in Bibliography are available for free online. - Launched this week, Archive, a new open-access journal on archives in the digital age. - A blog post, on historically-important call slips at the NYPL, launched a long discussion on Ex-Libris and in the comments thread about the appropriateness of releasing researchers' call slips. - An unfinished Scots dictionary compiled by James Boswell has been rediscovered at the Bodleian Library, after having been incorrectly cataloged. Lexicographer Susan Rennie, who made the find, has started a new site to highlight Boswell's effort. - Australian book collector Iain Herriot's library will be auctioned for charity today in Brisbane. - Andrea Wulf's Founding Gardeners; review by Paula Deitz in the NYTimes. - Joshua Kendall's The Forgotten Founding Father; review by Nicholas Basbanes in the LATimes. - Daniel Richter's Before the Revolution: America's Ancient Pasts; review by Charles C. Mann in the WSJ. - Arthur Phillips' The Tragedy of Arthur; review by Daniel Ulin in the LATimes. - Geraldine Brooks' Caleb's Crossing; review by Abigail Deutsch in the San Francisco Chronicle. - Sotheby's London will sell Travel, Atlases, Maps & Natural History titles in 210 lots on 10 May, including a Paolo Forlani world map (1570), estimated at £100,000-150,000; a first edition of Purchas his Pilgrimes (1625-6), estimated at £60,000-80,000; an archive of embroidery templates and artwork from the workshop of Egypt's Dar al-Kiswah, estimated at £60,000-80,000; and a first edition of John Gould's Birds of Europe (1832-1837), estimated at £45,000-60,000. - The fourth part of the collection of Michel Wittock will be sold at Christie's Paris on 11 May, in 80 lots. Watch for a full writeup of this in the summer Fine Books & Collections. The top-rated item in this sale, but a wide margin, is a fantastic copy of Description de l'Égypte ou Recueil des observations et des recherches qui ont été faites en Egypte pendant l'expédition de l'armée française (1817-1830), in 22 volumes and with its own wooden storage/display case. The copy was previously owned by Jean-Joseph Courvoisier, Justice minister to Charles X. It's estimated at EUR 500,000-700,000. Some other fine bindings and artist books are included in this sale. - Also at Christie's Paris on 11 May, 238 lots of Importants Livres Anciens, Livres d'Artistes, et Manuscrits. Some important John Gould titles are among the top-estimated lots: a Birds of Australia (1840-1869), estimated at EUR 120,000-180,000; A Monograph of the Trochilidae (1880-1887), estimated at EUR 100,000-150,000; and Birds of Asia (1850-1883), estimated at EUR 80,000-100,000. Other key illustrated natural history books are included, as well as a fair number of interesting incunables. - Swann will sell Literature; Art, Press & Illustrated Books on 12 May, in 479 lots. A numbered copy of Dalí's Die Göttliche Komödie (1974) is estimated at $7,000-10,000; a copy of the Vincent FitzGerald edition of Joyce's Epiphanies with Susan Weil and Marjorie Van Dyke rates an $8,000-10,000 estimate. - At Bloomsbury London on 12 May, Continental & English Literature and Manuscripts, in 532 lots. - At Sotheby's Paris on 18 May, Books and Manuscripts, in 107 lots. A collection of Robespierre papers rates the top estimate, at EUR 200,000-300,000. A first edition of Andy Warhol's 1¢ Life (1964) is estimated at EUR 100,000-150,000, and a typescript copy of Le Petit Prince (1943) could fetch EUR 40,000-60,000. - Christie's New York will sell Printed & Manuscript Americana on 19 May, in 210 lots. The top-estimated lot is a very cool one, a copy of the first edition of the first publication relating to New Netherland (Breeden-Raedt aende Vereenichde Nederlandsche Provintien. Antwerp: Francoys van Duynen, 1649.) No copy has sold at auction since the Streeter Sale in 1967, and this one is estimated at $70,000-100,000. Among the other goodies in this sale are a copy of Peter Force's 1833 printing of the Declaration of Independence, estimated at $15,000-20,000. Also on the block will be a copy of Dryden and Lee's Oedipus (1735), from the library of Benjamin Franklin (estimated at $12,000-18,000). - Also on 19 May, PBA Galleries will sell Americana, Maps and Atlases, in 376 lots. The top lot is an extensive archive of letters and clippings related to Sanford B. Dole and his family, estimated at $10,000-15,000. - Sotheby's New York will host the third round of sales from the James S. Copley Library on 20 May. I've previewed this sale here. So say, just hypothetically (hrm, hrm) that there were to be a searchable/browsable database of early (pre-1825) American private libraries (in effect taking some of the data collected here and presenting it in a more robust way, including unitemized libraries, proposed libraries &c., all in one place). What info would you like to see included? What ways would you like to be able to search, sort, and/or browse the data? (I'm intentionally leaving this open-ended instead of laying out what I've got so far in order to get the widest range of responses and thoughts). Drop me an email, or a comment here. Would very much appreciate your suggestions and thoughts. - Ian Kahn headed to Paris this weekend for the Antiquarian Book Fair there, and is filing dispatches about books, touring, and some mouth-watering food! - Adrian Johns' talk "The Promise and Peril of Universal Libraries", delivered at the 2011 California International Book Fair, is now available online via the ABAA website. - The May AEMonthly is up, featuring pieces on a few upcoming auctions, &c.
- A composer/law student has created the Internet Music Score Library Project, which includes more than 100,000 scores to date. - Philip White has a short piece, "A Bibliovore's Dilemma," on The Historical Society blog. - Arthur Phillips talks about The Tragedy of Arthur on this week's NYTimes Book Review podcast. - Alejandro Lopez de Haro writes for the Columbia News Service about how rare books and the rare book market will likely remain vibrant, even in the age of the e-book. - The NYTimes Diner's Journal blog covered the NYPL's menu-crowdsourcing effort this week. - An interesting blog, NYPL Librarians, offers short biographical sketches of New York Public Library branch librarians, 1901-1950. - The Guardian posts a gallery of bookplates from the BL's collection. - Arthur Phillips' The Tragedy of Arthur; reviews by Carlo Wolff in the Boston Globe and Stephen Greenblatt in the NYTimes. - Gary Gallagher's The Union War; review by Eric Foner in the NYTimes. - Geraldine Brooks' Caleb's Crossing; review by Sam Sacks in the WSJ. - William Deresiewicz' A Jane Austen Education; review by William Pritchard in the Boston Globe. - Maya Jasanoff's Liberty's Exiles; review by Thomas Bender in the NYTimes.